Pieter de Hooch (1629-1684) was a painter of the Dutch Golden Age. Born in Rotterdam, his father was a bricklayer and his mother was a midwife. 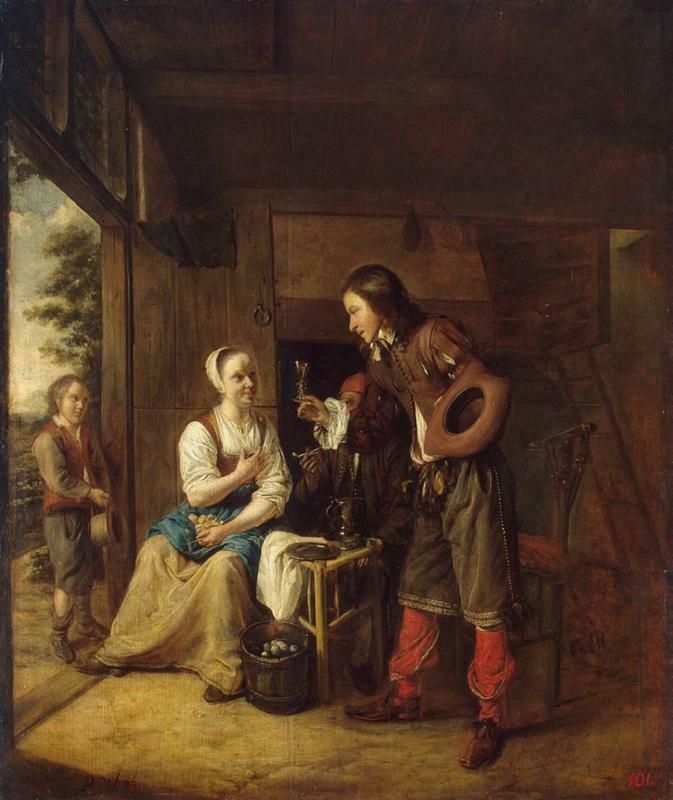 He studied in Haarlem, where he apparently began developing his reputation for interiors, often with men and women in conversation. De Hooch returned to Rotterdam where he became painter in service to a linen merchant and art collector. This appointment caused to travel extensively around the Netherlands, including Delft where he eventually moved. One of De Hooch's most famous works was from this period. Moving to Delft in 1654, de Hooch joined the Guild of St. Luke, where he was a member at the same time as Johannes Vermeer. 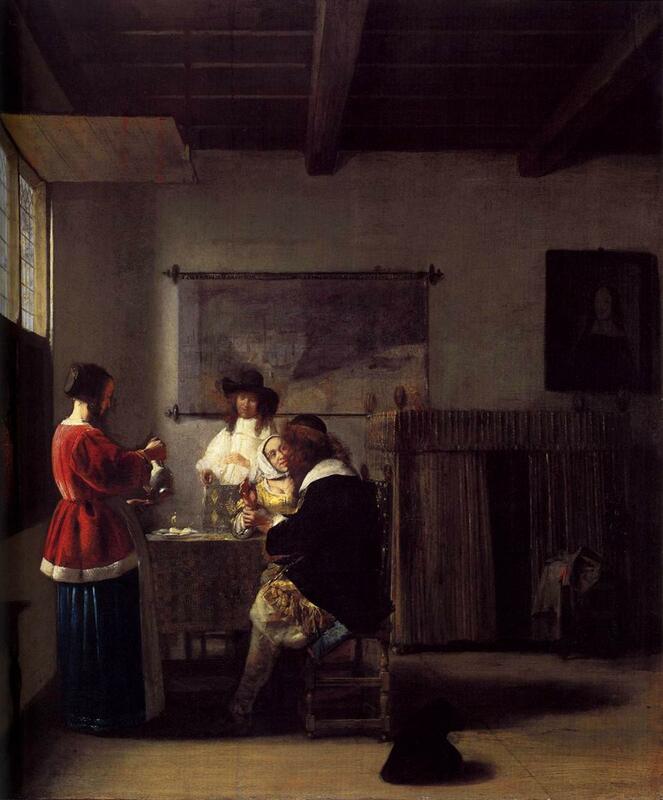 Some of de Hooch's works from this period strongly resemble Vermeer. 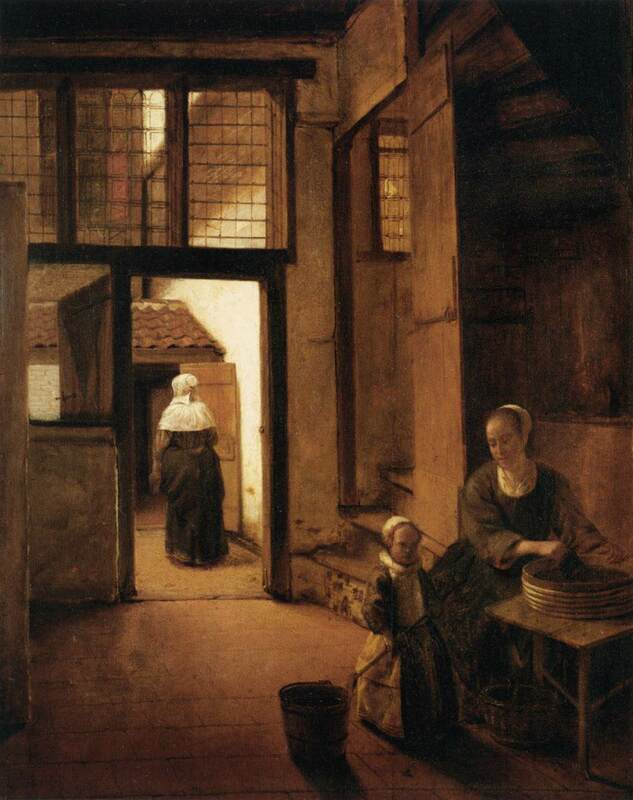 De Hooch's reputation grew, and he became known for his quiet domestic scenes with open doorways. This motif often led to rather complex compositions. Like most Dutch painters of the time, de Hooch also demonstrates a clear interest in the complex and beautiful ways that light shapes a scene. The interior scene I have featured exhibits both of these tendencies. It contains de Hooch's signature open door, which in this case opens to reveal a significant distance to the courtyard. In this piece he also included a second egress–the stairs that lead to the next story at the edge of the painting. The scene contains some natural light from that distant doorway, and perhaps some that shines onto the doors of the linen closet, but overall the scene is rather dark and the figures are in shadow. However there also seems to be light coming from just beyond the staircase, where the wood is lighter and warmer at the very top of the stairs. The warm wood color also appears on the linen closet and the beam on the ceiling. Meanwhile, the painting is quite intricately detailed, from the architecture in the minuscule courtyard, to the beautiful pattern of the linen basket, the art on the wall, and the small bowl that sits on top of the wardrobe. The spatial complexity of this painting gives it a lot of its interest, but the rich colors and the palpable presence of the figures also create a painting of great depth and beauty.